Fake news has a new target in Karnataka – the church. Find out the truth about these viral videos and images in our fact-check. 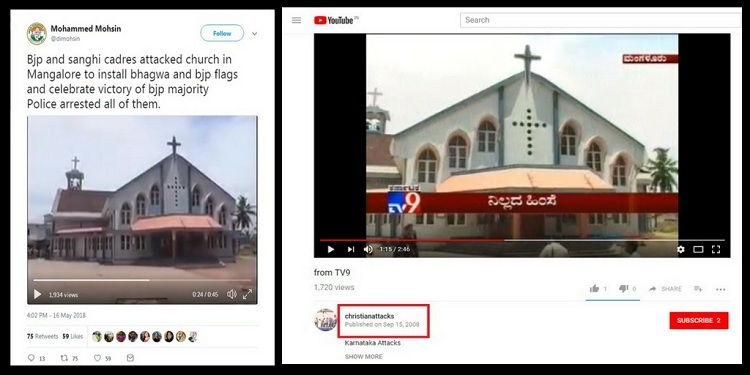 A series of old and misleading videos and images involving a few churches in Karnataka’s (Mangaluru) Mangalore region have been viral on WhatsApp and social media following the Bharatiya Janata Party’s (BJP) victory in the recently concluded assembly election. 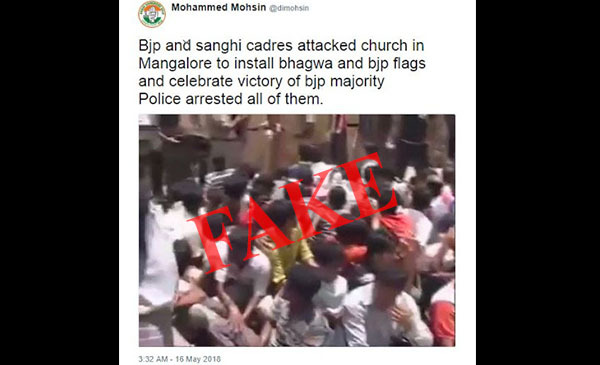 Social media posts like the one below claim that BJP and Sangh cadres attacked a church in Mangaluru and tried to plant BJP flags to celebrate the party’s victory. The video, which was posted to Twitter on May 16, was posted by one Mohammed Mohsin who appears to be a supporter of the Congress party. However, a fact-check revealed that the video is nearly ten years old and shows the outer facade of Saint Sebastian church in Permannur, Mangaluru. A YouTube clip with TV9’s logo shows similar visuals of police rounding up people and making them sit on the ground, as seen in the tweet. BOOM cannot independently verify the incidents that took place in 2008. A separate clip showing police storm St Sebastian church has gone viral on Facebook. However, the same sequence of events can be seen in an Al Jazeera news report from 2008. “No attacks on any church in Mangalore have taken place till Thursday morning. The video going around on social media is very old, nearly ten years old. This is incorrect information,” Marcel Monteiro, public relations officer of the Mangalore Diocese told BOOM. A fact reiterated by local police in Mangaluru. Mangaluru Police Commissioner Vipul Kumar told BOOM that there had been no incident reported of vandalizing or attack on any religious structure in the city. He said, “No church was attacked in the city or in the outskirts. Such an incident would have definitely reached the ears of the police force. This rumour is the work of some miscreants,” Kumar said. 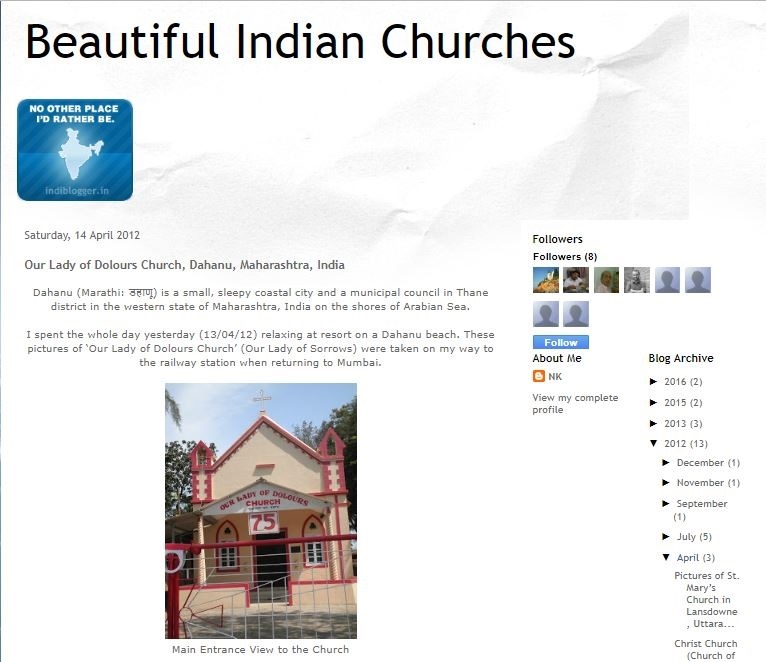 A separate image showing supporters of the BJP in front of another church are also being circulated on social media. The image is being shared with an implied context that the celebrations were intended to send a message to the local Christian community. Through a Google Image search BOOM confirmed that the picture was of Saint Lawrence Church in Bondel, Mangaluru. Marcel Monteiro of Mangalore Diocese told BOOM that while supporters of the party were near church premises no untoward incident took place. “The BJP workers had burst some crackers in front of the St Lawrence Church gate on the day of the election verdict but no trouble was created,” Monteiro said. 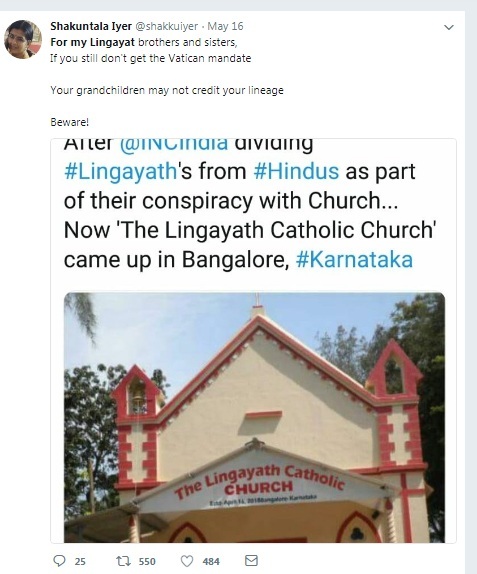 A third image claims to show that the Christian community in Karnataka has built a ‘Lingayat Church’. However, the image is poorly photoshopped and even misspells the word ‘Lingayat’ adding the alphabet ‘h’ to it.